April 11, 1955 – Civic leaders meeting at the Museum of Science and Industry learn that a proposal for “the worlds’ greatest exposition center” [Chicago Daily Tribune, April 12, 1955] to be built at a cost of around $34 million is in legislation that will be introduced in Springfield within a week. A telegraph from Illinois Governor William Stratton confirms that he has seen the plans and “deems them essential to the welfare of all citizens of Illinois.” Newly elected Mayor Richard J. Daley, attending his first civic meeting since his April 4 victory, says, “This is one of those bold, imaginative, and comprehensive projects needed for the continued progress of Chicago.” Also announced was the conclusion of the State Street council that a site at Twenty-Third Street and the lakefront would be an appropriate setting for the huge center. Former United States Senator C. Wayland Brooks, the secretary of Chicago Park Fair, Inc. says, “We either move now to get the laws needed to go ahead and become the No. 1 city as to exposition facilities, or we fall behind other cities which are proceeding with such facilities.” Tentative features of the structure include: (1) 600,000 square feet of floor area with “a single sweep of 300,000 square feet of open floor space without columns; (2) a capacity of 60,000 people in a building that could be used for simultaneous conventions; (3) an arena with 22,500 seats, theaters with 5,000 and 1,700 seats and 65 private show rooms and committee rooms; (4) air conditioning throughout the structure; (5) indoor parking for 2,600 cars with an outdoor parking lot that could accommodate 10,000 cars; (6) interior motorized partitions that would permit “an almost infinite variety of arrangements for use of the vast space; and (7) seats on the lake side of the building that would be used for aquatic events. The building did get built although it was scaled down from its original plan, especially in the special events spaces. The main exhibit hall ended up with about 320,000 square feet, and there were just short of two dozen meeting rooms with a 5,000-seat theater tacked on to the south end of the structure. Of course, it didn’t last long. The exhibition center opened in November of 1960 and seven years later during the night of January 16 a massive fire levelled everything but the Arie Crown Theater, designed by Edward Durell Stone. For a lot more on McCormick Place you can turn to this entry in Connecting the Windy City. April 11, 1900 -- The Lincoln Park board decides to sign contracts for the remaining sections of Diversey Boulevard, a move that will complete the ring of boulevards around the city. Alderman K. Blake asks that the assessment regarding the completion of the boulevard be put off for a year or two, but the board’s attorney tells him that “a rebate had been granted on the first assessment which would more than equal the amount of the proposed assessment.” [Chicago Daily Tribune, April 12, 1900] The board does, however, delay the new assessment of $1.17 a foot until January of 1901. In 1869 the Illinois legislature created the three park districts in the city, one for the south, one for the west, and one for Lincoln Park. The legislation charged the three districts with the development of a unified system of parks and boulevards ringing the city, the first major planned system of parks and roadways in the country. The west park system was to be connected to the Lincoln Park system by way of Diversey Boulevard. The ring of boulevards was largely complete, except for Diversey, by 1880. For two decades precious time was lost as a perfect storm of opposition to the widening of the street gathered. 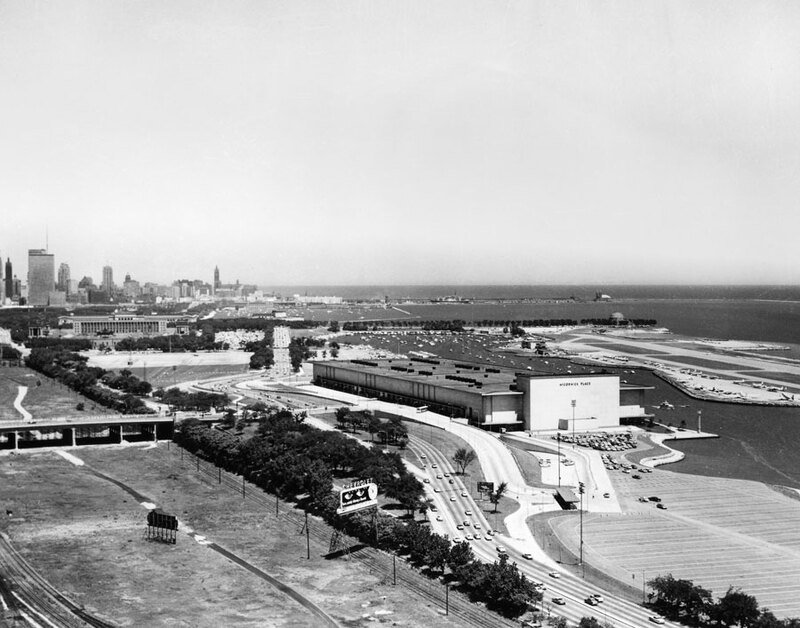 The working- class residents with homes at a distance from the lakefront objected to the increases in taxes that would come as part of the project. The wealthier residents with stately mansions near the lake felt that widening the road would diminish their property values. Industries and factories near the river, where a bridge would be needed, understandably objected to losing part of their property as the road was widened. 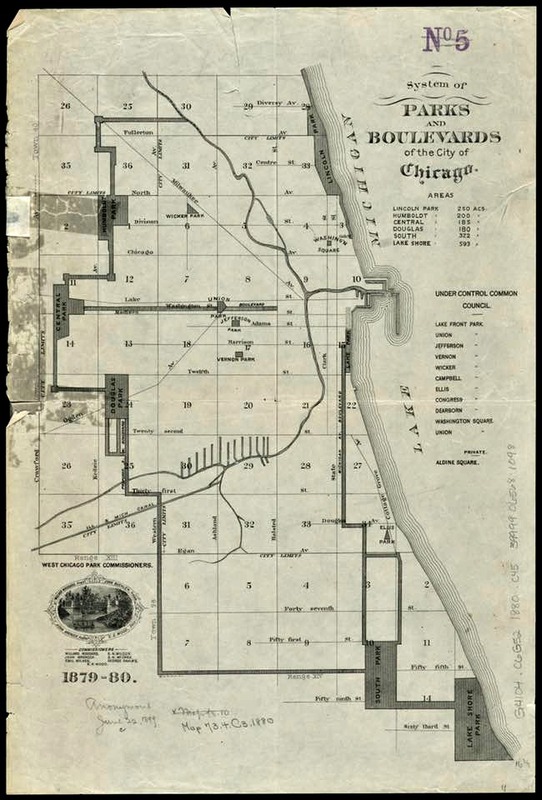 Most importantly, in the two decades that had elapsed since the rest of the boulevard system was completed, Diversey had filled with residences, businesses, and factories to such an extent that its widening simply became impractical at any price. The 1879-80 map above shows the boulevard system largely complete with Diversey Boulevard only finished up to the west side of the river. 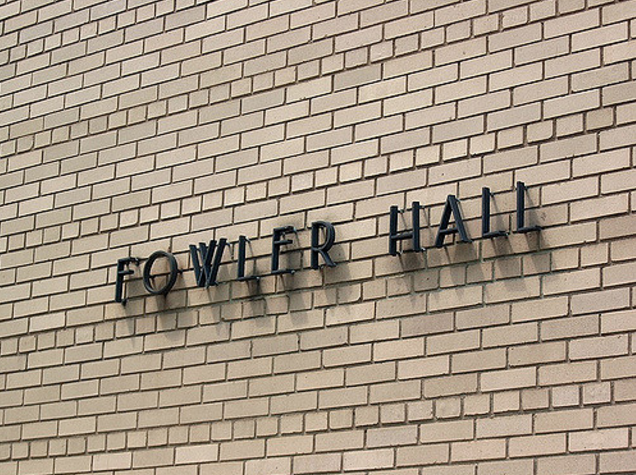 April 11, 1949 – Ceremonies are held to dedicate Farr and Fowler Halls, the first two dormitories in the $15-million building program at the Illinois Institute of Technology. 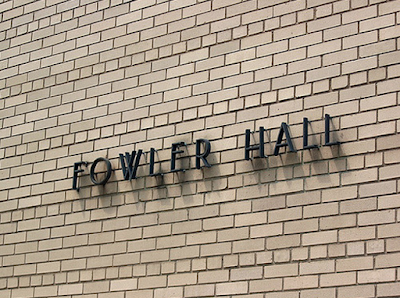 Farr Hall is located at the southwest corner of Thirty-Third Street and Michigan Avenue and is dedicated to Charlotte Farr, the mother of real estate dealer Newton C. Farr, who also is a member of the board of trustees for I.I.T. Fowler is located one block north and is dedicated to the memory of Mr. and Mrs. James M. Fowler, residents of Lafayette, Indiana. Each of the four-story dormitories will accommodate 109 students with each building costing $239,640, including landscaping and furnishings. Dr. Henry T. Heald, president of I.I.T., speaks at the dedication as well as James D. Cunningham, the chairman of the board of trustees. Donald L. Sickler, a freshman architecture student from New Jersey, represents the student body. In the above photo notice the English course brickwork and the lettering that Mies van der Rohe selected. April 11, 1945 -- For the first time since the Stockyards fire in May of 1934, every piece of fire equipment in the city moves to battle two lumberyard fires, one at 1800 N. Ashland Avenue and the other on the south side at 2452 Loomis Street. 45 pieces of equipment respond to the 5-11 alarm blaze on Ashland, and while it is still burning, 61 are dispatched to Loomis Street. Eleven firemen are injured in the battle to contain the fires as 54 mile-per-hour winds make the work nearly impossible. 500 fire fighters work to get the fires under control. As the Chicago Daily Tribune photo below shows one would have had a pretty good look at the flames from the north side fire. The trestle in the photo still exists. It was moved from this location to carry the "606" bicycle and walking trail over Western Avenue.